The recent alleged leaks and some of the speculation for the 'iPhone SE 2' suggest it will have a notch at the top, potentially housing the TrueDepth array. While there is doubt that it will happen, there's still some grounds for Face ID to make it onto the cheapest iPhone in the lineup. I'm sure you've heard some of the rumors claiming Apple's upcoming "iPhone SE 2" will have Face ID, using the TrueDepth camera system introduced with the iPhone X. Some critics may think this is unlikely to happen, since Face ID is a top-of-the-line feature reserved for the premium end of Apple's range, but there's still a few reasons why it's actually a great idea to use it. First of all, Apple is heavily invested in Face ID hardware and software production. If this iteration of the iPhone SE won't pack the TrueDepth sensor, it could be another couple of years until we see another SE model that could have it. Face ID and the TrueDepth sensor array has been a huge success, helping the iPhone X become not just the best-selling iPhone, but the best-selling smartphone model worldwide since its release. More iPhone models are expected to pack the TrueDepth sensor array, when the main lineup undergoes its annual refresh this fall. There are even rumors of an upcoming iPad Pro gaining Face ID, so if these rumors are correct, an "iPhone SE 2" without Face ID could be left in the dust. The iPhone SE is the cheapest new iPhone you can get, starting from $349. You might argue that the iPhone SE's price-point is too low to incorporate Face ID, but if Apple can bring the cost of parts down, this could actually be a great reason for the second-generation iPhone SE to come with it. If Apple wants to go full-force into the future with TrueDepth and Face ID, it makes sense to offer it across a wide-range of devices. There are many users who are currently held back from being able to use Face ID because of the massive $1,000 price-tag attached to the iPhone X, so a TrueDepth camera system on their cheapest iPhone model would make the transition to widespread Face ID usage more seamless. If the "iPhone SE 2" doesn't gain Face ID, it'll most likely stick with it's small rectangular screen instead of an iPhone X-style edge-to-edge display. Depending on the design, it might feel ancient compared to the new iPhone models packing the TrueDepth camera system. Users of the iPhone SE love it because of its small form factor and original design. Face ID would allow for a full edge-to-edge screen that'll provide more screen space while maintaining the small form factor. On the other hand, many are saying Apple is unlikely to equip the next iPhone SE with Face ID because it is trying to keep costs for this model to a minimum. There is also the possibility Apple will offer two "iPhone SE 2" models, one with the TrueDepth array and one without. The original iPhone SE was released in March 2016, making it over two years since its release, without an announcement of a new model. There may be a longer wait before one surfaces, as despite some Eurasian regulatory filings suggesting otherwise, there are rumors that the "iPhone SE 2" will be released alongside the annual iPhone refresh this September. Given history, it is unlikely Apple will reveal or release the "iPhone SE 2" at WWDC this June, since they've generally waited until September to reveal their new iPhones. Even so, we are still expecting Apple to unveil some new iPad Pro models alongside iOS 12. Here’s why it’s a bad idea, cost. I'd surmise that Apple, though it's sizable existing supply chain, has driven down the component cost for FaceID, second generation, while also assuring an ample supply. 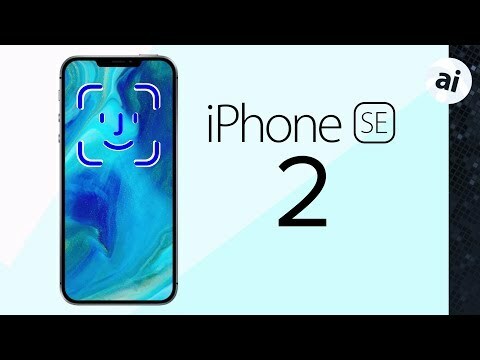 Expect all of the rumored new models to be released this fall to sport FaceID 2, though I would be surprised about an SE 2 with Face ID. Of course, so would be the rest of the smartphone industry. But what exactly is the cost? The cost of the TrueDepth sensor comes down, as volume increases over models using it. At the same time, the SE would drop the entire TouchID mechanism, which cost is rising as it is used in fewer models. The edge to edge display increases the costs, but doesn't necessarily have to be OLED, so not necessarily a major cost increase. Hard to make that judgement without more information. If it gets Face ID people will say it obviously had to get it. If it doesn’t get Face ID people will say, Face ID, are you crazy? Conveniently, people are never wrong. I'd wager that the parts cost of Face ID is similar to the Touch ID technology. If Apple was able to have enough components produced, you might see it on all models this year. I think on the SE, cost matters a *lot*. There's no way that TouchID costs, which has been around for several years and which vendors other than Apple have already adopted (at least at the component level) are the same as FaceID. So there's that added cost. A larger LCD - if Apple goes for the edge-to-edge display - is an additional new cost. So is the required new chassis. Finally, we all know that Apple loves its margins (37-40% for iPhones) - no way it'll sacrifice them. Especially if it might cannibalize sales of the higher-end phones who *will* have this popular feature. There's no doubt in my mind FaceID will make it into the SE line. I highly doubt it'll be the upcoming model. Actually, the more I think about it, it seems to me much more likely that the SE will simply see the usual minor processor/screen updates and Apple will introduce another X model: one that's simply got the SE's form factor. I imagine you could squeeze a 4.7" edge-to-edge screen in there. Add a possibly new 6+" X+ and we'd have a complete X lineup - 4.7" X "mini": $799, 5.8" X: $899 ($100 reduction), 6+" X Plus: $999. The SE2 at the low-end still makes sense. Not sure if there's room/differentiation for a $699 "9". I doubt the SE2 will include FaceID. Apple isn’t one to throw out a bunch of models for no reason, so a “premium” SE2 with FaceID makes no sense. If I had an option of double the memory or a model with FaceID, I know which one I’d buy. I think there may be upgraded SE and new SE as well, with new low pover LCD with notch in case it is not too expensive and with Face ID. Getting rid of home button and Touch ID can save some money to Face ID. My wild rumor is that Apple could use under display finger print sensor for this low cost model. As such display are now in production for Huawei it can be Apple surprise. True is that some analist would probably spread that rumor if there would be possibility like that. Apple will definately not kill clasic SE because markets like India. Sigh. All input methods should be on all phones. Face ID and 3D Touch should be on the iPhone SE and iPads, just like Touch ID made it everywhere. It’s quite important for users and developers to have consistent usage habits. It shouldn’t even be a discussion. Pencil support should be added to the phones as well. Yep, because it would be awesome to have the large bezel required for a touch ID button AND a notch on the front of the phone. Why "should" all input methods be on all phones? That sounds insanely inefficient with needless added complexity. The vast majority people who have used Face ID have never looked back. Having both on a device would just muddy the waters, confuse users, and dilute adoption of the new system. These demands are the same superficial, sort-sighted complaints about Apple dropping ports, and demanding that Macs contain every single port imaginable. Apple isn't afraid to drop the past in order to move ahead, it's part of what makes them greater than anyone else in the tech space. I didn’t mean it that way. Face ID is Apple’s future biometric tech of choice. It should be on the iPhone SE and Touch ID dropped. Face ID should make it iPads, iPhone SE, Macs. Ie, it should be on all devices, just like the diaspora Touch ID had from first appearing on the 5S, with the tech spreading out to iPads and Touch Bar Macs. If Apple has a favored input tech, it should spread far and wide as possible. I didn’t mean making past, present and future input tech for the same device. Nope.The learning curve to go from Touch ID to Face ID is about half a second and consists of leaving your eyes open. The time it took to unlearn a home button in favor of the new process is a bit longer. Took maybe half an hour to retrain the muscle memory for not having a button anymore. It is never a "good idea" to replace fingerprint unlocking with face unlocking on any phone. In the vast majority of practical circumstances, TouchID is superior to FaceID. I'm dreading the day when there's no choice. They need to have 2 models. one for the people who like the small form factor and not because they're cheap/poor. Even Steve Jobs liked the small form factor. If Apple is able to bring the cost of FaceID components (if those are a critical cost component) down through economies of scale, improved design and general negotiation...and Apple decides to raise the price of iPhone SE 2 (if such a product is even planned) to, say $399 or $449. This might be a workable plan. Apple does like to keep the entire line at some degree of functional parity. Doesn't seem like an unreasonable possibility. I think that an LCD screen would need to have a small bezel on the bottom. You seem to be confusing different groups of people for the same group of people. How odd. There are a lot of people that have no interest in FaceID. Irrelevant. If Apple is interested in this direction, that's the direction. And, the cost won’t come down enough in v2 to make it in SE2. This would be the only reason they don't.